The recipe calls for bing cherries, but I used sour cherries and added about a teaspoon of sugar. It was still pretty sour, especially with the added lime juice, so I added a few squirts of light agave nectar as well. If you're not using bing cherries, I suggest you sweeten and taste as desired. In the end, this was really good...refreshing and fresh and pretty! I plan to use the leftover salsa on grilled chicken. 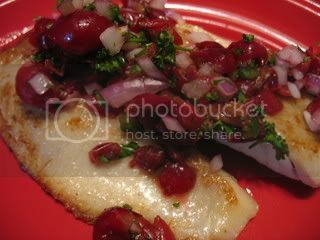 In a medium bowl, combine cherries, onion, cilantro, jalapeno and lime juice. Season with salt and pepper and toss to combine. 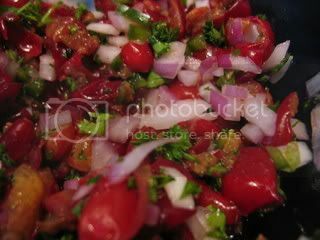 Set salsa aside. In a small bowl, stir together coriander, 1 teaspoon salt and 1/4 teaspoon pepper. Rub tilapia all over with oil; sprinkle with spice mixture. Grill or saute tilapia until opaque around the edges and underside loosens easily from grill or pan, 2-3 minutes. Using a metal spatula with a thin blade, flip fish; continue to cook until opaque throughout about 2-3 minutes. Serve topped with salsa.